These rainbows can be had in any kind of weather, and only a couple of extra steps are needed to achieve such colorful, tasty cake pop goodness. Perfect for St. Patrick's Day, or any day you need some extra cheer! One extra step involved dividing up the cake batter and adding a different gel food coloring to each. I ended up with these vibrant cupcakes. After each color is crumbled into fine cake crumbs this is what you end up with. Pretty, huh? After the cake balls were formed, I loved them already! Mix up cake batter as directed on the box. Spoon each cake color into two cupcake wrappers, and bake in a muffin tin according to package directions. You will have a dozen cupcakes. In six small bowls, crumble each cupcake color by color into fine crumbs. Add just enough vanilla frosting to create a playdoh like consistency with each of the colors. I only needed to add about a full teaspoon of frosting to each. In your palm, press a small amount of red cake dough, then press a bit of orange on top. Follow with yellow, green, blue, and purple, then roll the dough into balls. In a small, deep, microwave-safe bowl, heat the candy melts according to the directions on the package. Press the end of a lollipop stick into the melted chocolate, then press that end into the center of your cake ball, about halfway. Allow the candy melts to harden at room temperature. Gently dip each cake ball into the candy melts. Allow any excess to drizzle back into the bowl before pressing the bottom of the lollipop stick into a piece of styrofoam. Allow the cake pops to cool upright. When the pops have dried, use the leftover (there should be some left) melted candy melts to adhere the rainbows and clouds. Cut a mini marshmallow in half and flatten with your fingers. With a toothpick add a bit of candy melt to the back (sticky part) of the marshmallow and place on the pop. Add the other marshmallow cloud. Use a toothpick and add a dot of candy melt to the back of each (blue, green, yellow, orange, red) m & m (one at a time) and place in an arch between the marshmallow clouds. Stick each pop in the styrofoam block to dry. Oh my goodness... how cute are these!?! Love them! These are so unbelievably awesome I just cried a little. Gasp. I'm posting on edible crafts and fb and twitter and everywhere tonight!! I'm with Meaghan- I gasped out load! SUE!!!! I am beside myself with how adorable these are! Oh my goodness...these are adorable! Will definitely be featuring these tomorrow on our Fun Finds. You always amaze me with your ideas! How cute are these!! I love the cake part, and the rainbow decoration on the outside! Super fun! I love the cheery colors. These are happy pops. These are so fun. they made me smile. LOVE these Sue!! You're amazing!! How could you possibly not smile while eating a rainbow!! So fabulous! Pinning! Those are gorgeous! Stunning, really. I love the outside decorations too. Pinning! These are so fabulous Sue!!! I love the rainbow on the outside AND the rainbow on the inside! Pretty and being Irish, I love rainbows! These are so cute, very creative! love these sue (love anything rainbow) so i love the rainbow inside and out too....so cool as usual! Those little sweets would brighten anyone's day! I love the colors! So beautiful, these are amazing! Saw these on Craft Gossip! So really sweet! They look so beautiful inside and outside! these are so adorable, what a great idea Sue! Wow, I pinned these onto my Pinterest board, of course giving credit to your mastery!, and within 10 minutes I had 15 likes! I hope people click by to see them! What a fun idea! I love how you decorated the outside...this will be a perfect st. patty's treat! LOVE LOVE LOVE this... great job! These are amazzing!!! LOVE them! I love, love, love this idea! Thanks for sharing!!! 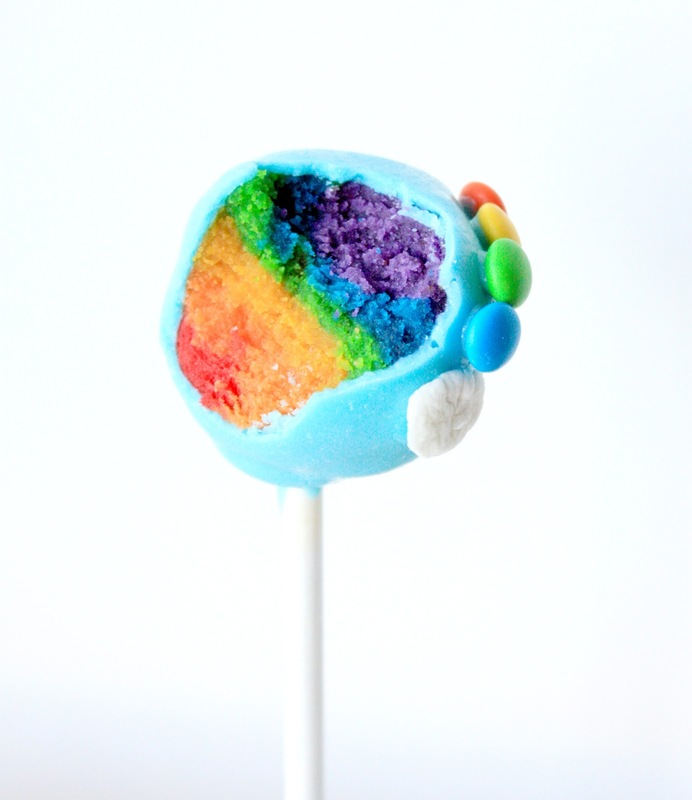 These rainbow cake pops just made me happy (and hungry). I love the two pics with the cupcakes and the crumbled crumbs. Rainbows make me happy, lol. Without the rain, that is! Which is mosts days in the UK. LOL. I love this idea!! too cute! Sue, I truly am in awe. My daughter would love these. Just adorable! I can't think of a single child who wouldn't love these. Pinning this RIGHT NOW!! Adorable!! I'm so doing a "rainbow" food theme on St. Patrick's Day!! GREAT idea! I will have to give this a try sometime soon :) Very creative! I LOVE the M&M rainbow on the outside and what a FUN, FUN surprise on the inside!!! These are so, so incredible!!! Wow! The coolest, happiest cake pops I've ever seen! Made these last night, but I didn't place them on a stick. Made them to be little bites of happiness snuggled into a shamrock mini cupcake wrapper, just perfect. Thanks so much for sharing!! I made these for my retro-themed 40th birthday party. It was A LOT of work as I made 60, but everyone loved them. I dipped them in white chocolate, but only halfway so that the rainbow colors showed through the bottom. Getting the consistency right is ESSENTIAL...I lost a few when doing the sticks, but I abandoned the sticks and made them into little cake drops along the front. I followed the rainbow trail from the Sweet Sixteen: Earth Day Collection. Congrats on being featured! I am loving your blog! Awewome. I'm gonna make these for sure! Really hope you read this. Thank you for the information! I did comment and ask for the proper credit for my pops and photos, but I doubt if anything will be done. It's very disappointing how dishonest some people are. Looks like it's gone now (the stolen images). Thanks for posting this cute interpretation of Bakerella's Cake Pops! 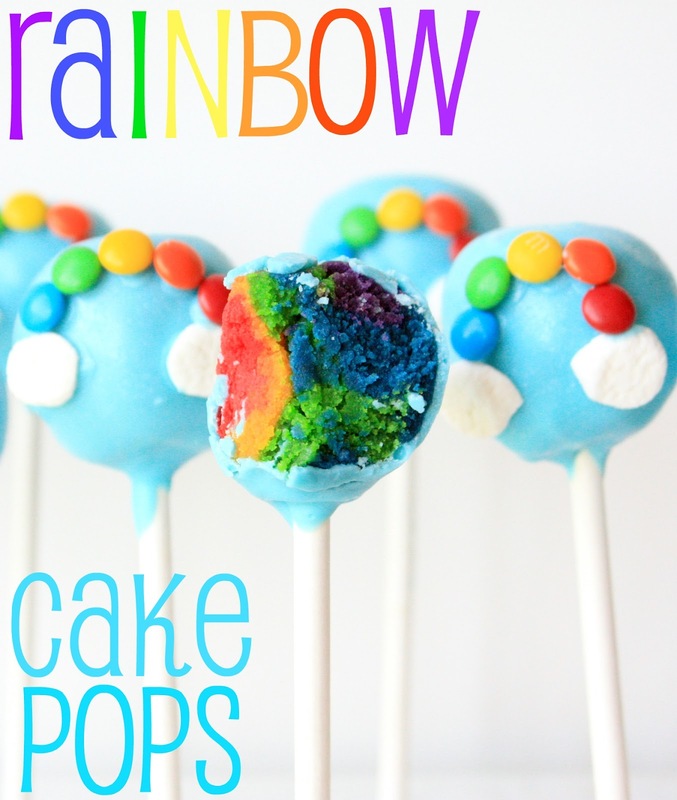 I love all things rainbow and these cake pops are just adorable!! Very cute and the presentation makes them look really do-able! Wow, adorable and totally amazing. Beautifully presented too. These are great !! I had just made my first time ever cake pops the other day. I am going to make these today !! Thanks for a wonderful Tutorial !! Are these good? Did anyone try these? Cool!!! I wanna make these one time, maybe today??? xD!!! Love the Cake Pops idea. very cute! could you tell me the brand of color paste or gel you used to get such vibrant colors? thank you!